The European Community has pledged respect for the cultural and linguistic diversity of its Member States and has recognized minority languages as an inherent constituent in this regard. This development reflects a broader trend within the Community towards grappling with less obvious aspects of supranational governance. Minority language groups turn optimistically to `Europe' in response. But, despite rhetorical promises, just what can the EC actually be expected to do in the realm of minority language protection, a politically sensitive and traditionally domestic concern? Arguments put forward to date focus primarily on philosophical, moral, economic, and political discourse. 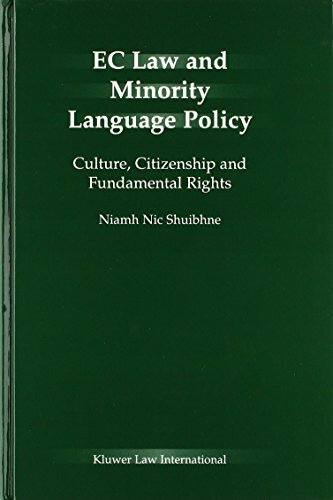 While these considerations are a vital aspect of the debate on minority languages and on linguistic diversity more generally, the question of legal basis remains largely unanswered. For the first time, this book traces comprehensively the existence of an appropriate legal basis for action undertaken by the EC in this domain, striving in particular to locate a pragmatic yet effective balance between legitimate possibility and acceptable limitations.